Chainexerciser is no longer available, except on special order – I now offer health items. Health advice is based on personal experience. The health solutions offered are natural. Click here to view sister site and to place an order. Known to many people as either black salve or "Cansema", this salve is capable of routing out fungus and skin cancer. See the numerous videos put on on "Cansema" on www.youtube.com for a demonstration of its effectiveness. The main ingredient is zinc chloride. 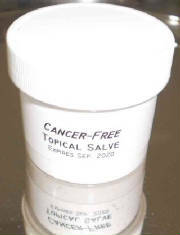 I successfully used this product to remove cancerous tissue in my feet, ankles, and hand. A very interesting article was put up on how to eliminate cataracts by simply using eyedrops by a certain Dr. James Howenstine (http://www.newswithviews.com/Howenstine/james179.htm). In this article, Dr. Howenstine recommends two different sources of these amazing eyedrops, one of them being known as CAN-C. I looked up the ingredients in this formulation, and found that there is only one active ingredient in the formulation—namely N-acetyl-L-carnosine. The other ingredients are a buffer to match the pH of the solution with that of the eye, glycerin for lubrication, and benzyl alcohol as a preservative, all in a distilled water base. The active ingredient, N-acetyl-L-carnosine, is set at a concentration of 1%, which works well in most cases except for those that are well advanced. 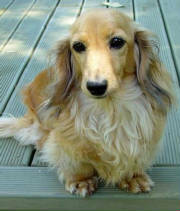 A 2% solution has been given successfully to dogs with advanced cataracts. "Initial results in only 3 months, optimal cataract removal within 6-12 months." The method was invented by a Russian doctor, who is described in detail on this site and others. I calculated that if someone (or a pet) had cataracts in both eyes, and that they wanted maximum results, they would need to apply 8 drops/day x 365 days/year = 2920 drops to remove cataracts in both eyes completely. In the CAN-C vendor site (wisemedicine.net), they require 24 boxes (each containing 2-5ml vials) to solve this problem, for a total cost of 24 boxes x US$33.25/box = US$798.00. In my view, the addition of non-active ingredients does not enhance the performance of the product, and I do not like the addition of any kind of alcohol, although it is needed for long-term preservation. Consequently, I located a very high grade of N-Acetyl-L-Carnosine that I simply add to distilled water in either a 1% or 2% concentration, with a limited shelf life of 6 months. Thus, I make up batches of the cataract solution on an as-needed basis. My wife has currently starting using these drops, and has noticed some AGEs (Advanced Glycation Endproducts) coming out of her eyes, so we are hopeful that her problem will be solved soon. The eye doctor who examined her said that her vision had deteriorated to 20/200 in her left eye. We plan to go back to the eye doctor in 6 months to see how her eyes improve. The eye doctor said that simply giving her a new pair of glasses with an adjusted focal length would do nothing to solve her problem. The fact that her health background includes diabetes means that she almost certainly has cataracts. We wanted to confirm this possibility, but were unable to locate an eye doctor who could see us within a reasonable amount of time. Thus, we started taking health matters into our own hands. Since I started making cataract eyedrops out of 99.6% pure N-Acetyl-L-Carnosine, I thought about making these drops available to anyone else who might want to purchase them, and for significant savings. 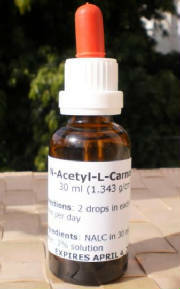 I am offering 30 ml eyedropper bottles of anti-cataract solution for only 40% of the price of CAN-C. Note that if you purchase the drops, they should be used immediately, and should be discarded after 6 months out of concern of their shelf life without alcohol. Thus, if someone wants to purchase the eyedrops for one year, then they should make two purchases 6 months apart. Previously, I mentioned that 2920 drops are required to solve cataract problems in two eyes. Since a 30 ml bottle contains 426 drops, then 7 bottles are required to solve the problem. I am selling the bottles for $45 each, which brings the total price of 7 bottles to US$315.00, which is 60% less than the CAN-C product. This product is likely to be more efficaceous as well, as it has zero non-active ingredients. If you wish to purchase the drops, please specify the number of 30-ml bottles you desire, and I will make up the solution and send it to you immediately. Refer to order page for details. 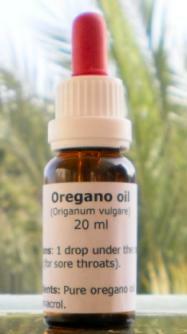 This high quality Oregano is pure Mediterranean oil with approximately 70% carvacrol. I've tested several different substances for their antifungal activity, and Oregano oil came out on top. I got rid of strep throat in less than 24 hours at the onset of the disease. I know of another person who had a full-blown case of strep throat who cured it in 3 days. In her case, her throat hurt so bad that she couldn't swallow. This is an amazing remedy that also cured her asthma. After taking the Oregano oil, she no longer needed to use an aspirator. I suspect that Oregano oil can handle many respiratory problems, including tuberculosis. Lugol's iodine was the universal medicine 100 years ago. By simply dipping a cotton swab (Q-Tip) into the Lugol's iodine solution and applying the wet iodine to the inside of your nose, it is possible to obtain instant relief from congestion. (Don't try this with drugstore iodine, as it will cause extreme discomfort because of its alcohol content.) 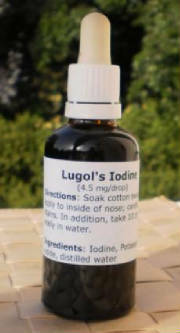 Unlike drugstore iodine, Lugol's iodine is water-based. Also, Lugol's solution can be taken internally, unlike the drugstore tincture that contains denatured isopropyl alcohol. It is because of this toxic form of drugstore iodine that the need arises to stipulate that it is only for external use. Dr. David Brownstein, an iodine researcher, has discovered that approximately 94% of patients he tested were deficient in iodine. This is largely a result of the presence of toxic halogens in our environment that displace mercury in the body: namely chlorine, fluorine, and bromine. Many sufferers of cancer (all types) can benefit from taking Lugol's iodine in amounts not exceeding 125 mg/day on average. Advanced cancer patients can safely take 250 mg every second day using "pulsed" dosing. Most people can take 50 mg/day as a maintenance dose. If you haven't taken iodine before, I recommend that you only take 1 drop (4.5 mg)/day initially. If you have significant fungal, bromine, or fluorine issues, you just proceed slowly, gradually increasing doses. A great advantage of Lugol's iodine is that it dislodges mercury lodged in your body, making it easier for chelation agents such as Cilantro leaf or Chorella to carry it out of the body. 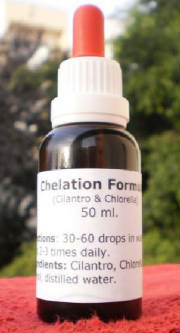 The chelation formula is an ideal adjunct to Lugol's iodine, as its components bind with the mercury dislodged by the iodine. Many people have too much toxic mercury in their systems. Think about mercury fillings and vaccinations that contain mercury compounds. Getting rid of mercury fillings is not only expensive, but dangerous. A safe alternative is to take oral chelators on a regular basis to move the mercury out of the body. Such chelators are Cilantro (Coriander leaf) and Chlorella, as documented in many places. Put a couple of drops on your toothbrush before brushing. It is advisable to do this up to three times per week. The antiseptic properties of H2O2 (hydrogen peroxide) kills germs effectively, stopping bad breath. Put 5 drops in a small cup of water, preferably distilled, and swish this solution between your teeth. If you gargle with it, you do not need to worry as it is food grade. Put a mixture of 1/4th cup of 3% hydrogen peroxide and 1/2 cup of baking soda (sodium bicarbonate) in an opaque container, as light degrades the H2O2. Spray the 3% food grade hydrogen peroxide with a nasal sprayer toward the back of the throat while inhaling. Do this periodically through the day (do not spray via the nose). The hydrogen peroxide will provide needed oxygen, as hydrogen peroxide breaks down into water, H2O and oxygen, O2. Oxygen acts against anerobic pathogens and fungus. Take 3 drops in a small glass of water between meals--either 2 hours after a meal or 1 hour before a meal. This can be done twice a day for good general health. Cancer patients can take larger amounts internally according to information available on the Internet. In my opinion, one should not rely entirely on this method of getting rid of cancer; it should instead be considered a complementary treatment to other natural treatments. The first three solutions are unacceptable, as they sting the nasal passages, and don't even work that well. Colloidal silver alone cannot eliminate H1N1 viruses at 10 ppm concentration, and you don't want to use larger concentrations that can turn you blue (100 ppm and above, typically). I recently discovered a supercharged formula that I use that contains both 10 ppm colloidal silver and golden seal root combined. It is a powerhouse remedy. And for continued viral protection, swab Lugol's iodine (above) in your nostrils: it is an unbeatable combination. By killing the cause of the mucus, namely viruses, your nose clears up. One 14 year old dog named Sanneke in New Zealand is currently taking 2% NALC drops and is already navigating after a couple of months of usage. She can now step off of the porch without falling. Much safer and less expensive than eye surgery, full sight restoration is possible with a year.